An email from Peter Croke at Merle Wood & Associates confirms that, following an engine room fire off the coast of Fort Lauderdale, Trinity's 49.1m superyacht Lady Michelle is now for sale as a co-central agency between him and Merle Wood. Delivered in 2007, this all-aluminium motor yacht has a Dee Robinson interior sleeping up to 11 guests in the owner's party in five staterooms plus a nanny's cabin. 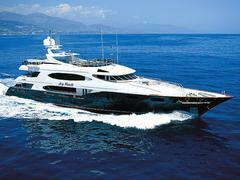 Asking $12 million, Lady Michelle is for sale on an 'as is, where is' basis according to Peter.